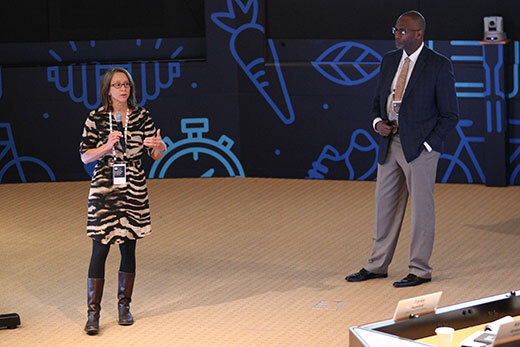 Emory professors Amy Webb Girard and Charles Moore present details of the Southwest Atlanta Coalition for Healthy Living at the GE HealthyCities Leadership Academy, held Oct. 10-12 at GE’s Leadership Development Center in Crotonville, New York. A cross-functional, intra-organizational team made up of Emory faculty, staff and students, a local grocery chain, and a health care clinic has received an award of $25,000 from General Electric to collaboratively fight obesity, diabetes and other diet-related disease. Called the Southwest Atlanta Coalition for Healthy Living, the team includes representatives from Wayfield Foods, the HEALing Community Center, Emory's Office of the President, Emory Continuing Education, the Emory Urban Health Initiative, Goizueta Business School and Rollins School of Public Health. As a winner of the HealthyCities Leadership Academy’s Open Innovation Challenge, the coalition received $25,000 from GE to create a program to engage members of the community on healthy eating and provide information and assistance in food preparation and preventative care. Teams from eight other cities also received funding to combat areas of concern in population health. The Atlanta coalition aims to improve health outcomes by linking services at the HEALing Community Center, founded by Emory/Grady physician Charles Moore, with nutrition and healthy eating programs at the Wayfield Foods store on MLK Drive in southwest Atlanta. The coalition will train Wayfield employees on healthy eating and food preparation. The HEALing Community Center will provide nutrition prescriptions for healthy foods to patients. At Wayfield, these trained “health ambassadors” will assist shoppers with making healthier food purchases, link them with other in-store programs, and provide information on services at the HEALing Community Center. HEAL patients will work with Wayfield Foods health ambassadors to fill their nutrition prescriptions and engage in in-store nutrition, health and cooking activities. Representatives from Emory will support the process through marketing, food labeling, training health ambassadors at the store and clinic, and program monitoring and evaluation. The focus area in Southwest Atlanta is one of the city’s most under-resourced. These neighborhoods, and others like them, have shortages of quality healthcare, affordable food and resources to make healthy dietary decisions. More than half of the community’s population lives below the poverty line with 98 percent of its children qualifying for free or reduced lunch. Working in concert, the coalition will provide a holistic approach to educate and serve the area at the grocery store and health clinic — contextual centers for quality life change. “Through this innovative program, we will be able to provide additional assistance to community members and patients in making healthy choices by reaching beyond the medical care setting to provide continuous support in their communities and in their day-to-day lives,” Moore said. GE’s commitment to the effort includes mentorship and additional training for teams as they develop plans and execution. Teams will compete for an additional $250,000 in funding from GE next year. “GE is committed to enabling better health for more people through supporting the development and deployment of innovative population health strategies,” said Sue Siegel, CEO, GE Ventures and healthymagination. “Improving the health of a community is a complex effort that requires collaboration from many stakeholders. "Each of the nine winning proposals brings in local businesses to help governments, foundations and private organizations more effectively develop and implement community health initiatives that truly make a lasting impact," she notes. The coalition expects to launch the program at Wayfield and HEALing Community Center in early 2017.